No two islands in the Caribbean Sea are the same. Each has its own charm and attractions. Trick is how to find the island that makes you the happiest. To help you identify the Caribbean island that most speaks to your heart, Royal Caribbean has put together this thoughtful guide to connect you and your island under the sun. Keep in mind that most of these islands are home to one of our many Del Sol stores, which are always there to answer your questions and to help you have more fun in the sun with our color-changing products. Did you know there are more than 7,000 islands in the Caribbean that are part of approximately 28 nations? With two newly amplified ships in the Royal Caribbean fleet—Mariner and Navigator of the Seas—offering three-to-five-night cruises in 2019, there’s never been a better time to book a short getaway to one of these stunning tropical spots. But how do you narrow down where you should head next? While we’d argue there’s a reason to visit every destination available on our Caribbean cruises, some places really speak to a traveler’s vacation style, be it relaxed and indulgent or adventurous and on-the-go (or anywhere in between). If you’re wondering where to begin, we’ve gathered some thought-starters here. With nearly two dozen different locations to choose from, Royal Caribbean makes it easy to find your ideal warm-weather escape. 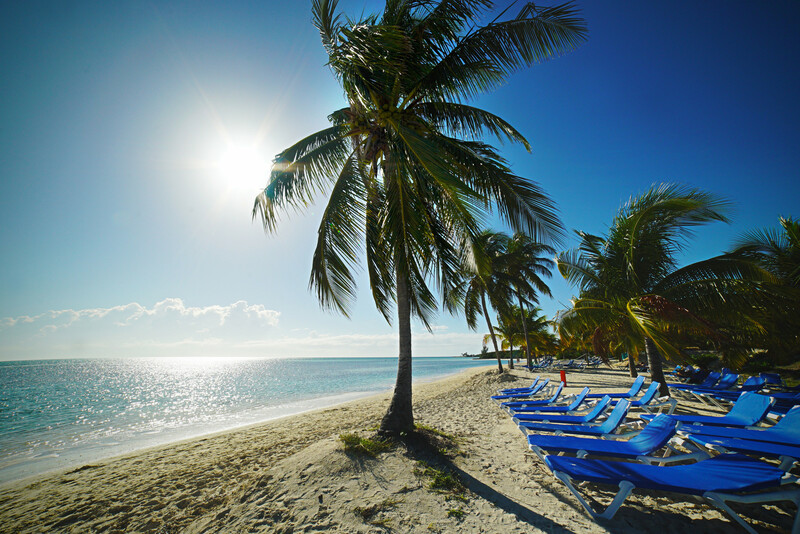 Whether your dream vacation day involves lounging on a white-sand beach, sipping cocktails poolside or taking a plunge down the tallest water slide in North America, you can do it all at Perfect Day at CocoCay, Royal Caribbean’s new private island paradise. It’s an adventure like no other: Opening in May 2019, prepare to soar 450 feet above the air in a helium balloon—the highest vantage point in The Bahamas—or take a dip in the largest freshwater pool in the Caribbean and get your adrenaline pumping at Thrill Waterpark, which has no less than 13 hair-raising waterslides. When it’s time to unwind, Chill Island offers a serene escape with gorgeous, undisturbed beaches and roaming bartenders. Craving some upscale TLC? We’re pulling out all the stops at our Coco Beach Club, which includes private attendants and overwater cabanas (the first of their kind in The Bahamas). To take in all of the natural beauty surrounding you in Belize, you’ll want to climb to the top of El Castillo; at 135 feet, it’s one of the tallest Mayan structures in this tiny nation. From the top, you can see the lush rainforest of Peten, the nearby mountains and even across the border into Guatemala. You also can explore the amazing Altan Ha pyramid, an ancient temple built as a symbol of Mayan honor and devotion to the Sun God. If you’re looking for Belize City’s “wild side,” look for flocks of toucans and parrots in the tree-tops, manatees along the coast, baboons at the Community Baboon Sanctuary, crocodiles and wild howler monkeys along the Old Belize River, and jaguars, pumas, ocelots and more at the esteemed Belize Zoo. Royal Caribbean’s shore excursions include snorkeling along the barrier reef, cave tubing and a riverboat ride to get you up close and personal with nature. The main port on the island of Bonaire in the Caribbean Netherlands, Kralendijk is a picturesque and charming town lined with delightfully pastel stucco houses turned out in pink, orange and lime green. Scores of pink flamingos call the island home, but it’s what lies below the surface that makes the destination even more enticing. The city is widely considered a top diving destination in the Caribbean. For a sampling of what this dreamy island has to offer, enjoy snorkeling or diving among coral reefs, turtles and brightly colored fish in the protected Bonaire National Marine Park; tour the local salt flats and mountains; and don’t miss the local gastronomic delicacy, cactus soup. The capital—and largest—city of Dominica, Roseau is a small and compact urban settlement. If you appreciate the finer things in life, we have two words for you: Champagne Beach. These effervescent waters produce an actual “fizz” from the volcanic sea floor. After swimming alongside parrotfish in bubbly waters, there are plenty of other ways to pass the time, including ogling the West Indian architecture in town while scouring the local boutiques. You also can treat yourself to the relaxing and therapeutic powers of Dominica’s natural mineral waters while surrounded by the island’s lush tropical vegetation. Roatan, Honduras: wild and untamed. This narrow strip of land was born with an adventurous spirit, as it was once the domain of Spanish conquistadors and British pirates. Roatan lies in the Caribbean at the southernmost tip of the second biggest barrier reef in the world. Diving with sharks and snorkeling with pods of squid and other exciting sea life are popular pastimes, and Royal Caribbean also offers a survivor-style challenge course that will have you scurrying along jungle paths in the thick rainforest, crawling in mud ravines and climbing cargo nets and hills. If you prefer your challenges with altitude, the Adrenaline Zip-Line Adventure will take you soaring through the skies and between mountains on an exhilarating zip-line tour. Puerto Costa Maya, Mexico: fascinating and soulful. Costa Maya, once a trading post for the Mayan Empire, is located in the Mexican Caribbean and best known for its jungles, beaches, lagoons and ruins. While this corner of the Caribbean might look serious and sedate at first glance, there is a wealth of history to be explored. The ancient city of Chacchoben dates to 360 AD, when it played an important role in the distribution of such precious items as wood, jade and exotic birds. It was largely unexplored until 1999, but archaeologists now believe this fascinating locale was a thriving metropolis 1,500 years ago. On its Chacchoben Ruins Exclusive Drive, Royal Caribbean gives you the chance to marvel at the temples, stroll their surrounding gardens and dive deeper into this culture.